This report from University of Minnesota astronomers (UofM link of press release) heralds discovery of "an enormous hole in the Universe, nearly a billion light-years across, empty of both normal matter such as stars, galaxies and gas, as well as mysterious, unseen “dark matter.” While earlier studies have shown holes, or voids, in the large-scale structure of the Universe, this new discovery dwarfs them all." The 'bullhorn' illustration at the top is from the National Radio Astronomy Observatory website. 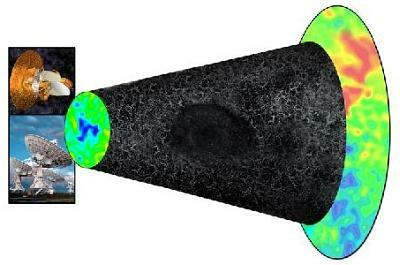 The black 'nucleus' in the bull horn image is the big hole. 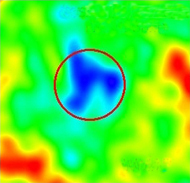 The graphic gives perspective on how the information from radio waves of the earthbound VLA Sky Survey (seen in blue square above) combined with microwave energy reported (from space by) the WMAP Spacecraft (the orange square) have both, using different perspectives, helped to locate this enormous hole devoid of any dust/matter in our universe. A team from the University of Minnesota, Twin Cities, had been studying data from the Very Large Array Sky Survey, which is mapping the entire universe with radio waves. The team members focused on one part of the survey where the temperature of the CMB is lower than normal [the blue gap on the psychedelic looking pic]. This cooling is significant because interactions with both visible and dark matter warm the CMB slightly, and so the team suspected that matter [in the cold spot] was absent. Further observations of the zone, located between 6 billion and 10 billion light-years away, revealed it to be not only devoid of galaxies but also about a billion light-years wide, the team will report in an upcoming issue of The Astrophysical Journal. "What we're suggesting is that there is no matter in this void, either normal or dark," says radio astronomer and co-author Lawrence Rudnick. The pie chart shows the generally accepted proportions of three components of our universe. EDIT/added - Aug 31 - Pie chart above and previous cylindrical image are from the previously mentioned WMAP site where interesting graphics and other info can be found. Content of the Universe-WMAP data reveals that its contents include 4% atoms, the building blocks of stars and planets. 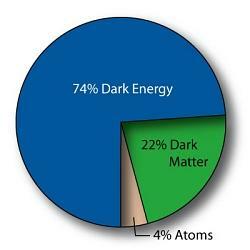 Dark matter comprises 22% of the universe. This matter, different from atoms, does not emit or absorb light. It has only been detected indirectly by its gravity. 74% of the Universe, is composed of "dark energy", that acts as a sort of an anti-gravity. This energy, distinct from dark matter, is responsible for the present-day acceleration of the universal expansion. Concluding that the zone is free of dark matter might be premature, cautions astrophysicist Harvey Tananbaum of the Harvard-Smithsonian Center for Astrophysics in Cambridge, Massachusetts. Making that determination is difficult and will require confirmation, he says. Meanwhile, cosmologist Paul Davies of Arizona State University in Tempe says the discovery is "potentially very important" for testing theories about the very early universe. The potential deviation from the inflation model is "a tantalizing pointer to some new physics at the dawn of existence." To read more about current study of the Universe and the BIG BANG theory as these have been modified with recent information from WMAP, go here. Now for something a little more down to earth. Science News has an article on a virus that seems to have some correlation with obesity in some people. Magdalena Pasarica of Louisiana State University in Baton Rouge, who led the new work, stresses that obesity has many causes, including genetic factors, overeating, and a sedentary lifestyle. In some people, however, adenovirus-36 may be the culprit, she says. Adenoviruses cause colds, but adenovirus-36, apparently, does more. And next this piece from The Scientist is interesting to me, has to do with certain receptors of bacteria being sensitive to light, and this factor having something to do with changes in potential virulence. It actually makes a lot of sense since it seems many living organisms from plants and even larger complex animals have responses to various wavelengths of light in our environment. I never gave much thought to lighting for the bugs we grew in the various incubators and our tests were pretty standardized anyway, growing critters that preferred dark places in humans. Even the few incubators with small clear panels at the door seemed minutely important to me, just a way to see how full an incubator might be, and what might be in there without opening the door and letting the warm air out. We always had the lights off in microbiology lab if no one were in there doing stuff anyway. 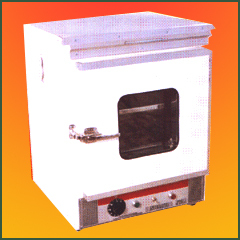 The heat in a laboratory in general can get pretty stuffy due to all the fridges, centrifuges, incubators and analyzers, etc. You can't use a fan due to potential biohazardous aerosol. Air conditioning is nice but is not always very efficient in rooms full of machinery. LOL, like I need more encouragement!! That pie chart is rather daunting, ie to think that our visible universe just totals 4&, you sure about that ? According to the WMAP project, this is the data they have so far. You can see images that we can all use from their project here. I should update and post the text that goes along with that image, had connection problems that day as previously noted. Thanks for the visit and the point! WMAP data reveals that its contents include 4% atoms, the building blocks of stars and planets. Dark matter comprises 22% of the universe. This matter, different from atoms, does not emit or absorb light. It has only been detected indirectly by its gravity. 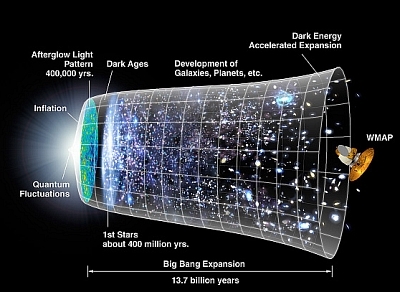 74% of the Universe, is composed of "dark energy", that acts as a sort of an anti-gravity. This energy, distinct from dark matter, is responsible for the present-day acceleration of the universal expansion.